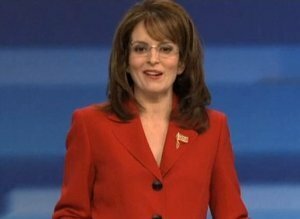 Since so many of the undeclared potential presidential contenders decided to skip the first official Republican primary debate, Saturday Night Live decided to treat us to their version of the GOP 2012 Undeclared Candidates Debate, with Tina Fey returning as Sarah Palin. The segment also featured Bill Hader as Fox’s Shepard Smith, Jason Sudeikis as Mitt Romney, Darrell Hammond as Donald Trump, Kristen Wiig as Michele Bachmann, Bobby Moynihan as Newt Gingrich and Kenan Thompson as the Rent is Too Damn High Party’s Jimmy McMillan. As expected, Fey stole the show with her Palin impression.